There are lots of things to hate about our current medical system, and all of us have our own favorite things to hate. This is mine: the fact that the system massively overcharges you if you’re uninsured, and they do it just because they can. If you’re uninsured, you’ve got no leverage, no alternatives, no nothing. So you get screwed. It’s like the shopkeepers who charge twenty bucks for a pair of flashlight batteries after hurricanes. Maybe it’s the free market at work, but if so, that’s all the worse for the free market. In the healthcare biz, it just doesn’t work. He misses the real reason for the screwed up system where the uninsured get charged the most. It is not at all like the shopkeepers who charge twenty bucks for flashlight batteries. It is not because doctors want to charge the uninsured more, or because they can, but because of how insurance reimbursement works. Different plans reimburse differently. Some pay more for some types of services and less for others. There is often no logic to how each company sets their fee schedule. Doctors survive poor payment for some services by the money made on others, but this differs with the insurance company. Since doctors are going to be underpaid on some items, we try to maximize income on the items each insurance company pays well on. This means charges are generally based upon the highest we reasonably expect to get for each service to maximize income from insurance companies who underpay on other services. Here’s a simple illustration based upon just two charges and two insurance companies. Let’s say that insurance company A pays $100 for X and $60 for Y. Insurance company B pays the reverse. To ensure they receive the maximum payment from insurances which discount what they pay, many doctors will charge s $110 for each and they will bring in $160. If the doctor tried to charge $80 each they would only bring in $140 ($80 from the company which approves $100 and $60 from the company which approves $60.) As there are actually many different insurance companies out there and nobody knows all their fee scales, doctors might charge $110 to guarantee maximum payment from the companies which value that service the highest. As there are still rare payers who pay all or most of a charge, a doctor might even add on more to offset all the other cases where a large percentage of the charge must be written off. The uninsured patient therefore winds up being charged $220 or more when the charge for those with insurance winds up getting written down to $160. The doctor might be happy to receive $160 total but it is not possible to set charges based upon receiving $160 when insurance companies will pay different amounts. One answer might be to charge uninsured people $80 and only play the above games with the insurance companies. However insurance companies pay a doctor’s customary and reasonable fees up to the insurance company’s maximum. If the insurance company found that a particular doctor was charging $80 to the uninsured, they would reduce their payments to $80, considering this to be their customary fee, while still only paying $60 for the other service. The result is that the uninsured do wind up getting charged more, but this is based upon responses to how insurance companies pay, not a conscious decision to obtain more from the uninsured.This is one reason that even a high deductible plan which winds up paying little might still be of some value. Even if your insurance doesn’t pay, you might be able to pay a lower amount than the full charges based upon your insurance company’s payment scale. There are also variations from different sources. In the simplified example above, most doctors might charge $110 but reference laboratories and hospitals might charge $200. Note that in Karen Tumalty’s example the problems come primarily from the hospital and labs, not their doctor. Even then, the prices charged are primarily based upon the fact that there are still rare third party payers who will pay the bill, not any belief that they will really be able to collect these sums from the uninsured. Actually the uninsured can often receive breaks. Most doctors and hospitals will agree to a payment plan for less than the actual charges for an uninsured patient who runs up a big bill. In contrast, Kevin Drum’s hypothetical shopkeeper tries to gouge everyone for the batteries. There is also a relatively low collection rate for charges to uninsured patients. I suspect that hospitals start from a high number to give themselves plenty of bargaining room. While I cannot legally use a different pay scale for uninsured versus insured patients, there is another way I at least give my uninsured patients a break. It is of value if I don’t have to submit insurance claims and if I don’t have to wait for payment. Therefore I give a discount for those who pay at time of service. This primarily benefits uninsured patients (along with patients whose office calls are not covered by insurance or have a large deductible). I figure insurance companies cannot complain as I’d give them the exact same discount if they paid me at time of service. With remakes of The Prisoner in the works, this old cover of Time caught the attention of Jesse Walker at Hit & Run. 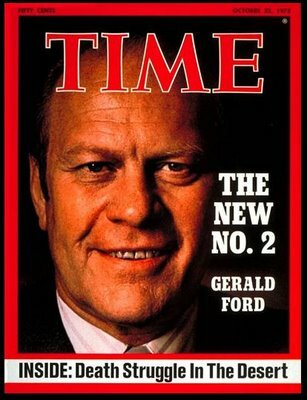 It is fairly old, from when Gerald Ford was appointed to be Vice President after Spiro Agnew’s resignation. I actually recall both when this cover came out and making the same allusion to The Prisoner. Krauthammer’s path is interesting: As his foreign policy opinions increasingly sync with those of the right, his economic and social policy increasingly aligns. The New Deal liberal with an affection for invasion becomes a tax cutting conservative with an affection for invasion. It’s not a particularly surprising trajectory: Peer influences are powerful. If you decide that Bill Kristol is a brave truth-teller on foreign policy you’ll naturally give his domestic ideas greater consideration. If you’re tired of being knocked around by Paul Krugman you’re less likely to credit the precision of his economic analysis. Why is Tonya Harding upset about her name being connected to kneecapping by Obama? She did do it.